Can you beat the winter vomiting bug? The end of the year traditionally sees the start of winter vomiting bug "season". Also known as norovirus, it can strike young and old and challenges the resources of Scotland's health sector. BBC News Scotland online asked NHS Highland what people can do to help control its spread. It is extremely infectious and causes diarrhoea, nausea and vomiting. Can you build up immunity to it? The virus continually changes so you do not develop lasting immunity, meaning you can get it more than once in a season. The virus spreads via other people coming into contact, either directly or indirectly, with infected diarrhoea or vomit. What precautions can be taken against it? The most important step people can take is to ensure good hand hygiene. Wash your hands regularly with soap and water, especially after using the toilet and before eating. Again, hand hygiene is very important. 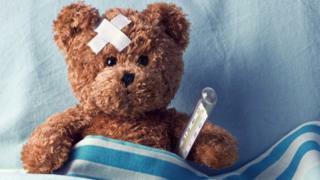 If your child has been ill our advice would be to keep them away from school/nursery until they too have been clear of symptoms for 48 hours. How can people help prevent the bug's spread to hospitals? Do not visit a hospital if you or someone you live with has symptoms. If you have a hospital appointment, please get in touch and, where appropriate, your appointment can be rescheduled. Wait until you have been clear of symptoms for 48 hours, as you may still be contagious, even if you feel well. If you visit someone in hospital, don't sit on their bed and keep the number of visitors to a minimum at any one time. Never touch dressings, drips, or other equipment around the bed. Is norovirus now more common? Norovirus has always been present and, particularly during the winter months as more people are indoors in close proximity to each other, it can be widespread across the UK. Awareness of the virus, as well as our ability to diagnose it, has certainly improved, which may contribute to the apparent rise in numbers of cases. What should people do to help ease the symptoms if they fall ill or a member of their family does? The best course of action is to stay at home and drink plenty of water to ensure you remain hydrated. People should also adhere to strict hand-washing techniques to reduce the spread of the virus. Where can people find more information and advice?